XSS targets the users of the application instead of the server. Although this is a limitation, since it allows attackers to hijack other users' session, an attacker might attack an administrator to gain full control over the application. Changing the look of the page within the victims browser. Mounting a successful phishing attack. Intercept data and perform man-in-the-middle attacks. Prior to sanitizing user input, ensure you have a pre-defined list of both expected and acceptable characters with which you populate a white-list. This list needs only be defined once and should be used to sanitize and validate all subsequent input. There are a number of pre-defined, well structured white-list libraries available for many different environments, good examples of these include, OWASP Reform and Microsoft Anti Cross-site Scripting libraries are good examples. Cookie was not marked as HTTPOnly. HTTPOnly cookies can not be read by client-side scripts therefore marking a cookie as HTTPOnly can provide an additional layer of protection against Cross-site Scripting attacks..
During a Cross-site Scripting attack an attacker might easily access cookies and hijack the victim's session. Mark the cookie as HTTPOnly. This will be an extra layer of defence against XSS. However this is not a silver bullet and will not protect the system against Cross-site Scripting attacks. An attacker can use a tool such as XSS Tunnel to bypass HTTPOnly protection. 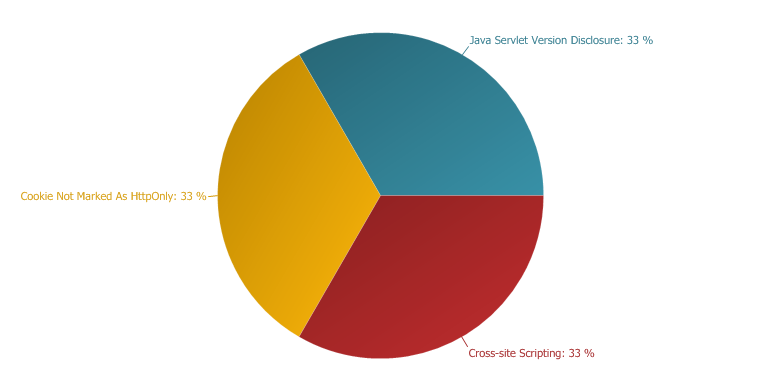 Netsparker identified that the target web server is using Java Servlet. This information was gathered from the HTTP Headers. An attacker can look for specific security vulnerabilities for the version disclosed by the SERVER header. Configure your web server to prevent information leakage from the SERVER header of its HTTP response.